This one time fee includes lifetime access to all of the videos, materials and exclusive access to the private facebook group. This course includes a certification as an "Organizing Expert". As a certified organizing expert, not only can you transform your own home, but you can help others by starting your own organization business. Here are some extra bonuses included with this course. This course includes many free printables that you can instantly download to help you declutter and organize your home and life. You will have access to an exclusive Facebook group which includes free webinars, private group training and exclusive content. 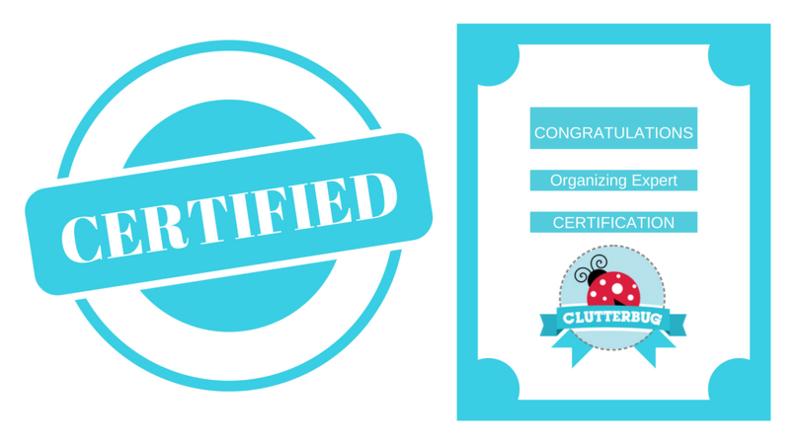 Upon completion, you will receive a printable certificate and a "Certified Organizing Expert" badge for your website. Hi! I'm Cas from Clutterbug. I have a successful YouTube channel, blog, podcast and two best selling organizing books. I have helped over half a million families get clean and clutter-free. I can't wait to show YOU how to become an organizational expert too!